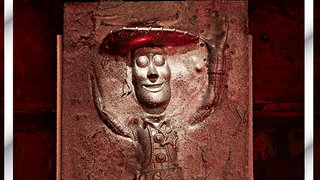 Photographer Henry Hargreaves mixes his childhood playthings with his love of food in this tasty, yet slightly creepy series of photos that takes molds of action figures and fills them with chocolate - creating the effect of the Carbonite freezing process from The Empire Strikes Back and Return of the Jedi. I love that Hargreaves included an Indiana Jones figure. Harrison Ford can't escape Carbonite Freezing even here! You can see pictures of some of Hargreaves' creations over at his blog, linked below.